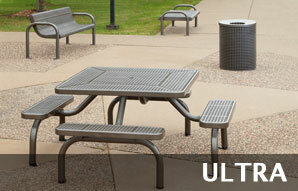 The Ultra Collection by Landscape Brands offers a vast selection of high quality steel picnic tables. These well designed tables are available with three distinctive steel patterns, expanded steel, perforated steel or slotted steel. With this wide range of coordinating products, you will have no problems creating a complete site furnishing with everything you need. Coordinating park benches, trash receptacles and cigarette urns are available. we have recently added some new additions to this collection with the Slotted Steel Picnic Tables. Built to last, these tables are finished with a powder coat finish along with a thick plasticol coating that maintains a high gloss appearance. FusionGuard gives these outdoor site furnishings extreme rust resistance. Click on the images below to see all of the impressive selections offered by the Ultra Collection by Landscape Brands.